Your senior loved one needs to observe proper routines for personal hygiene if you want them to stay healthy. Good hygiene is one of the most practical ways to protect them from many illnesses. However, there may be times when they cannot care for themselves without a little help from someone else. You can speak with your family members about taking turns to help your senior parent with personal care, especially with bathing, dressing, and grooming. It is essential that you all work together so that your senior loved one will stay healthy. When all of your schedules cannot meet your senior family member’s care needs, it is only appropriate to seek help from a provider of non-medical homecare in Indiana. Since showers or tubs get slippery, it is essential that a professional caregiver supervises and assists your senior loved one while taking a bath. Some senior citizens find it challenging to put on their clothes by themselves because of problems with mobility. A professional care attendant can help them by hoisting their arms up and slipping the garments into the right places. 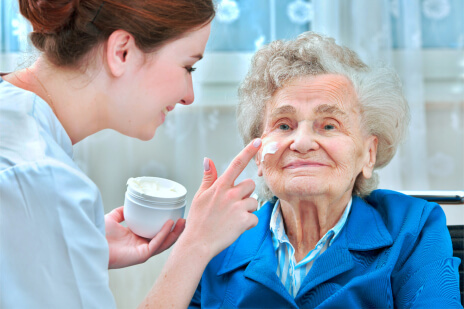 Seniors need to keep their skin moisturized because old age diminishes the production of their oil glands. A personal assistant can apply lotion or moisturizers on your senior loved one’s skin to make sure it stays hydrated after a bath. Seeking and accepting help from others is nothing to be ashamed of. It only means that you want to give your loved one the kind of professional home health care they need. If you want to hire a well-trained caregiver for your senior loved one, choose Advantage Senior Care as your home health care provider. This entry was posted in Senior Care and tagged good hygiene, home health care, non-medical homecare, skin care. Bookmark the permalink.